There are so many things that I love about Family Game night at home. I love that everyone is spending quality time with each other and it gives us a break from social media. Growing up my parents didn't have to worry about social media. However, they always made sure that we had a family game night at home or out in about. I have so many childhood memories of us having so much fun together. That I always try to incorporate that in my children's life. With my oldest going to college this year, we're being a little creative with how we're going our family game nights at home. However, it's still going to happen and our children our super excited about continuing the family tradition. The best part about the family game night is that you can be creative and as fancy as you want, which I love. There isn't a role. Do what makes your family happy! Below I'm sharing what my family does for our epic at Home family game nights at home. I love that you can plan your family game night or have them on a whim. I prefer to have our family game nights scheduled. I try my best to not have them the same week day each time to give everyone a chance to do what they love. i.e having a game night every Friday. I try my best to rotate the days. When the kiddos were younger the day really didn't matter so much. I try to have them planned for the year. However, of course, we get invited to events and typically we arrange our schedule so we can still make it and have our family game night an alternative day. Also, During the winter months our family game nights increase. Especially if we know in advance that we're going to have a snow storm and the state is going to close. Which is the perfect way for us to be snowed in! I love creating different themes for our family game nights at home. I love having using the holidays surrounding that month to base the theme off of. i.e Valentine's Day, Halloween, Thanksgiving, and Christmas. It's so much fun creating and decorating around our themes. I love creating a theme during the summer months and utilizing our outdoor space. What I also love about creating themes is creating the prizes that go along with them. Of course creating prizes is optional. However, my family does love getting a break from the chores. I meet so many people that don't have family game night at home because they are under the impression that you have to own a ton of games to make this happen for your family. Use your imagination! You can easily create games with the items that you have on your own. Have an old tree stump? Turn it to an outdoors tic tac toe game with paint and rocks. You can also create “minute to win it” games with items you have around your home. The possibilities are endless! Don't forget that you may have the option to borrow games from friends and family as well. Use the resources that you have. Me being the foodie that I am. I love planning our menu for the family game night at home. We've tried many different foods to have during our game nights. However, we always come back to our first love which is pizza. I typically will order our pizza online with Papa John's. I love that they have the option where you can order you pizza up to 21days in advance for cash orders and 3 days in advance for credit card orders. How cool is that?! We like to mix it up and try different toppings especially if we have a really cool theme that goes along with it. I'm loving Papa John’s NEW Gluten-Free Crust with Ancient Grains pizza. Papa John's created the most delicious pizza without worrying about a compromised taste. Use this special coupon code (GLTN2T) here to order your Gluten-Free Crust with Ancient Grains pizza for just $9.99. 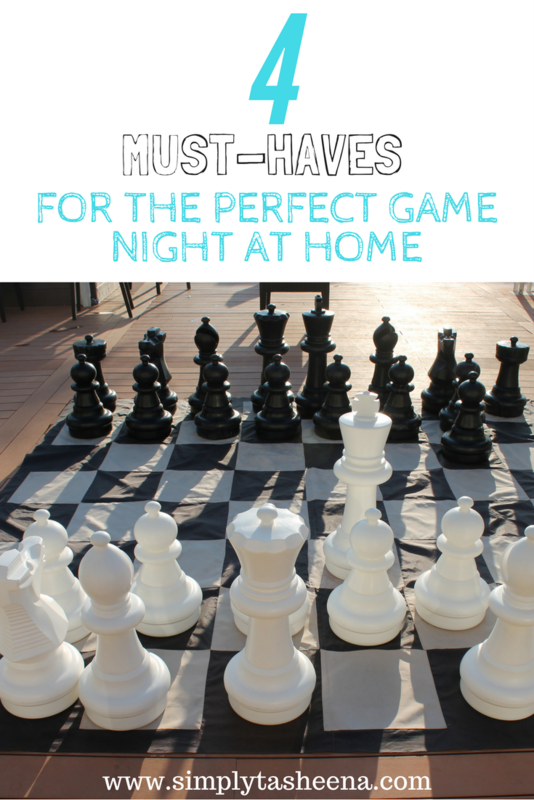 Creating the perfect family game night at home does not have to be stressful. It just takes a little bit of planning that you can do in advance or on a whim. 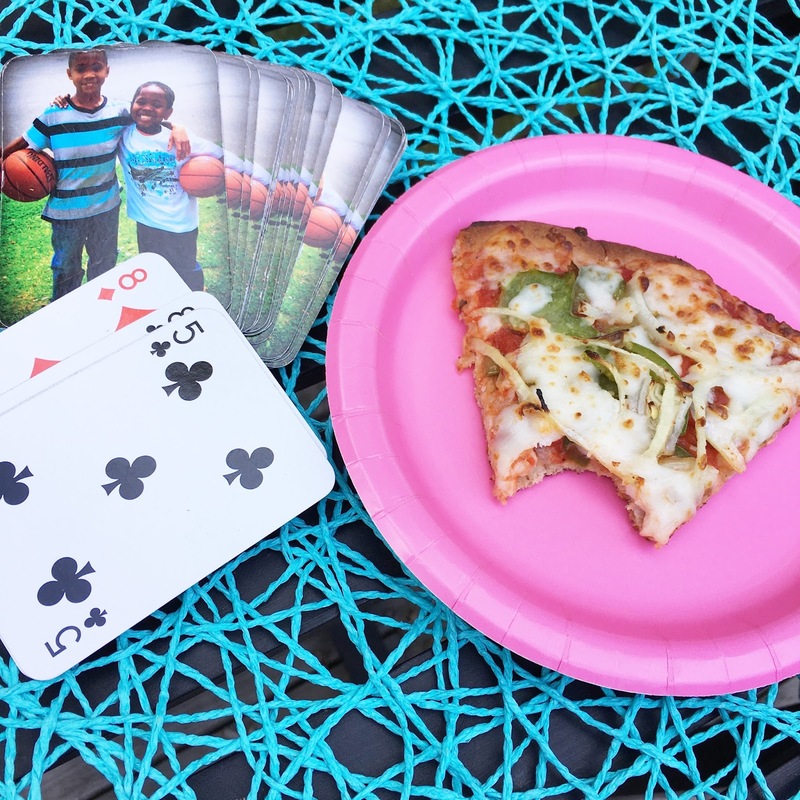 You can be creative with your night family game night or keep it pretty basic. But that best part is, you're with your family and you're having fun. Don't overthink the idea. Make it happen and have fun! Do you have family game night at home? WE love game night at our house, it's such a great way to spend time together. Is that chess set in your yard? It's amazing! We've been getting into games more and more. Our kids are still toddlers so, the games we play with them are simple and often get derailed by a crazy two year old. However, my husband and I have recently made a point to forgo the netflix some nights for a fun board game. It's simple, but those nights have become my favorite quality moments with my husband lately. They force us to turn off the t.v., sit down face to face and thoughtfully engage with each other. PIZZA! We love to have family nights in with movies, games and pizza! Such a low stress way to catch up with everyone and spend some quality time without spending too much money.